Although Beto described the wall running South, we just happened to have been on another reef beside the South wall. We explored the reef running west-east. Nick and I dropped down and found the top of the reef at around 130ish. We both agreed to drop down to 170ft to check it out for a few minutes then come up to 130 and hang out there for most of the dive. We dropped in and out of canyons and finally found 169ft. The vis between 40-50ft. The reef was covered with all the usual species, but what was very noticeable was the Elephant Ear Sponge and the beautiful topography. We made our way up to 130ft as planned and explored the reef until our time was up and we saw lights from a distance. It was Dave and Clinton. Not much longer we saw Sue and Beto. As planned we all met up as a group on our 70ft stop. Surface Interval: A pod of Risso Dolphin�s came to visit us. We also saw a few humpbacks. Fanshell Beach Pinnacle: The top of the pinnacle was 50ish feet and it drop to 120ft Nick Radov decided to sit the second dive out and I was lucky to buddy up with Sue and Beto. We kept our max depth at 100ft. We were fortunate to be able to explore a swim through and on the other side of the swim through, David and Clinton were signaling to us GPO! The GPO was hidden in the cracks. The size of the suckers were pretty large though. Just around the corner, a smaller octopus came out to play with us. Very Sweet!. Report from Clinton: We had a good group of 6 one the Escapade Saturday for some exploration diving; myself, Dave, Susan, Beto, Nick and Dionna. The plan was to explore the area Beto is calling Mt. Chamberlin which is a large pinnacle north of Flintstones. Naturally Dave had never seen this spot before and was worried that it might be another "Sammet Spire". Exactly why this was is unclear as the possibility of a dive anywhere near Flintstones being a bust is about zero. For the second dive we moved up to Cypress Point and the Fanshell Beach pinnacles. Beto wanted me to lead the group to the swimthrough. Problem is I didn't really remember where it was. Fortunately Captain Jim put the hook right next to it. Better still just on the other side of the swimthrough we found a Giant Pacific Octopus back in a crack. 5 minutes into the dive we could have called it on account of already having seen everything. Well this week weather was so good that Sue and I decided on a Frid/Sat diving plan. We meet Capt. Phil at Point Lobos and headed south to see what the ocean looked like. It was 2-4ft swell with a south winds, perfect conditions to try some new sites. I had a selection on area to check starting very close to Sea lions rocks (just out side the park) and heading west from there. This is a tricky area as there are some serious breakers to be worry about while doing your deco, but Frid's weather was good enough that we opted for the GPS closest to the rocks. The site, Naia wall, is a 800ft wall that start at 80ft and it drops down to 180-190ft. The wall is 800-1000ft long and it runs 300 degrees. Our anchor line missed the pinnacle by the 10ft and it went all the way to the sand. As we followed it down we had a look at the top of pinnacle. There were 4 to 6 small kelps at the top, and a lot of invertebrates on the way down. Very nice pinnacle. We scootered following the wall for 5 to 8 min, and until we reached a canyon going up. We had to back-up and while doing that we run into a school of about 20 big vermillion rockfish. We checked each other for about 1min. I love how these rockfish are not afraid of divers and actually come close to check you out. We continued scootering for another 10min and reached the end of the wall on the opposite side. This area is quite deep 200-240ft so we kept our depth while looking down at the amazing wall. Here is a map of the area. This site should only be dived in very flat seas and south winds. BTW, we saw some risso dolphins while entering the water so that's the reason we called Naia (dolphin) wall. Diving with John off of the Escapade. The original plan was to go South and dive Flintstones but the wind really picked up from the South making anything out of the bay dicey at best. We stuck our nose out Point Pinos for a look and quickly retreated into calmer water. We decided to dive a reef outside of Ballbuster that looked promising. Visibility near the surface wasn't so hot but below 70 feet it opened up nicely to about 60 feet or more. The reef doesn't have the color of some of the Carmel sites but it was still very scenic with a good covering of Metridiums and gorgonians. We saw about every kind of rockfish imaginable including brown, starry, rosy, yelloweye, vermillion, canaries, blues and gophers. Beto also found a torpedo ray. Video stills can be found here. Kawika, Chuck, Clinton and I took advantage of the flat seas today and headed out to the Farralons in Kawika's and Chuck's boats. Noonday is a gorgeous pinnacle with spectacularly vertical walls dropping from approx 70' to 150+. Vis was low at the surface but became clear and blue below 40'. Perhaps because it's so far offshore and not subject to predation by otters, there was an abundance of shellfish (large scallops, barnacles...) at the site. There were also huge schools of rockfish, though they were more skittish than those we find in Monterey. The Farralons are a beautiful place when the ocean is calm, and just being out that far in small boats is an interesting experience. Our plan was to scooter out to Three Sisters and take a scootering and swimming tour of that area. After yesterday's storm, dive conditions were not looking promising, with braille conditions in inner Whaler's Cove and 5'+ swells rolling into Whaler's from Carmel Bay. Geoffroy and I scootered on the surface out to the mouth of the cove, and with vis there improving to perhaps 10' decided to go ahead with the dive. Familiarity gained from many recent swimming dives of the area, and use of 30/30 for zero narcosis, allowed us to do the dive successfully - we easily found the hole in the wall and lone metridium. By the time we got to Three Sisters vis was as much as 30', and here again familiarity from recent swim dives allowed us to confidently tour all the pinnacles in the area without worrying too much about about getting lost. Overall we had a pretty good dive, in what otherwise were very marginal conditions. Sue and I took the day off to go diving before the onset of the big swells forecasted for the weekend. We went out with Capt Phil on his RIB, from Lobos. 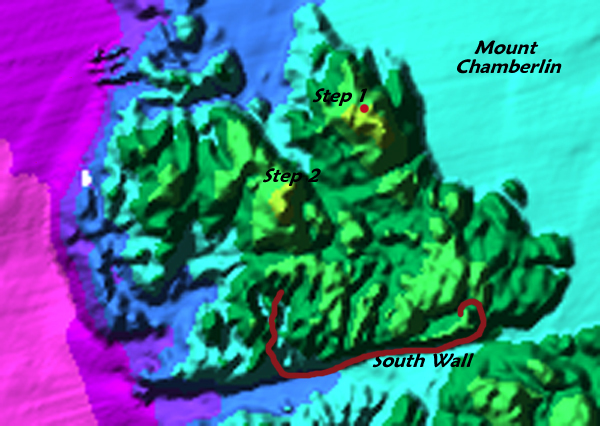 The original plan was to dive the south wall of Mt Chamberlin, but the winds were already picking up so we decided to stay close to home and do a traverse from E3 to Bluefish cove. We dropped with our scooters at the top of E3 in about 120ft of water. The water was a very cold 46 degrees with scooter chill factor making it seem even colder, but the visibility was great!! maybe 50ft... We started our dive on the southwest side and looped around the base while enjoying the gorgonians and the big elephant ear sponges. From there we headed north torwards Deep E3, and at about 200ft we started seeing several vase sponges. Some had decorator crabs sitting on them, as well as small fishes living inside. On a rockface we found a small basket star entwined in a gorgonian. After spending 10min in this area we headed east towards the Needle and enjoyed a 10min scooter run following the outer wall of the area. There were huge China rockfish along the wall, and some big vermilion. Once we got to the Needle we looped around once, taking in the beauty of the vertical walls covered with corynactus and zoanthids. This is an amazing pinnacle! Usually we circle the pinnacle many times, each time at a shallower depth, according to our deco plan. However this time we headed into shallower water at a 120 degree heading, to see what was there and if we could make it to Bluefish. We scootered for a couple of minutes and found a long, narrow ridge full of multi-colored hyrdrocorals, where we did most of our 100-80ft stops. From there we headed south looking for shallow water, where we encountered a nice pinnacle that went from 70ft to 30ft, perfect for our 50% deco stops. The pinnacle was covered with huge hydrocorals and was home to a massive school of blue rockfish on the east side. Big swells and surge were already hitting the area so we took shelter with the rockfish for the remainder of the dive. Once we got to 30ft, we shot our bag and moved away from the pinnacle. By this time we had scootered for about 70min, dove at least 5 different sites, and needless to say we really enjoyed the dive day. We slowly drifted among strands of kelp for our 20min of deco to complete the dive. Top side conditions were not as bad as predicted, and it was a gorgeous, sunny day. Here is the route we followed.